At least 398 people were put in prison, while 445 others were detained over the past 5 days, according to Turkish news agencies. Police carried out the operations in at least 32 provinces across Turkey. With most of the arrestees being businessmen, those arrested over the past 5 days also included civil servants, police officers, and academics. On Jan. 16, Mehmet Ali Tunç, the mayor of the Muradiye district of the eastern province of Van from the pro-Kurdish Democratic Regions Party (DBP), was detained as part of a terrorism investigation. On Jan. 17, Eleven military personnel including 3 colonels were detained as part of an investigation into the Gülen movement. On Jan. 17, Sultan Eylem Keleş, a journalism student at İzmir’s Ege University was detained over terrorism charges while she was leaving her school. On Jan. 17, seven out of 21 people who had previously filed legal complaints against President Recep Tayyip Erdoğan were arrested as a result of an operation targeting the Gülen movement. On Jan. 17, three out of 6 Turkish journalists who have been kept under police custody for the past 24 days, were arrested over terrorism charges. On Jan. 18, Istanbul Public Prosecutor’s Office issued detention warrants for 243 military personnel over their alleged use of ByLock, a smartphone messaging application which the government claims to be the top communication tool of the Gülen movement. On January 18, Turkish police detained a total of 137 people across Turkey over alleged Gulen links. In İzmir, a total of 41 civilians were detained on Tuesday on charges of using ByLock. In Malatya, 20 teachers who had previously been dismissed from their jobs by government decrees issued in November 2016 were detained over alleged links to the Gulen movement. In Ağrı, 14 civilians were arrested for alleged involvement in the coup attempt of July 15, Anadolu also reported. On Jan. 19, Ünal Tanık, the editor in chief of the government-closed Rotahaber news portal was arrested as part of an investigation into the Gülen movement. On Jan. 20, eighty-six police officers and courthouse staff members were detained across several Turkish provinces due to alleged use of a smart phone application called ByLock. 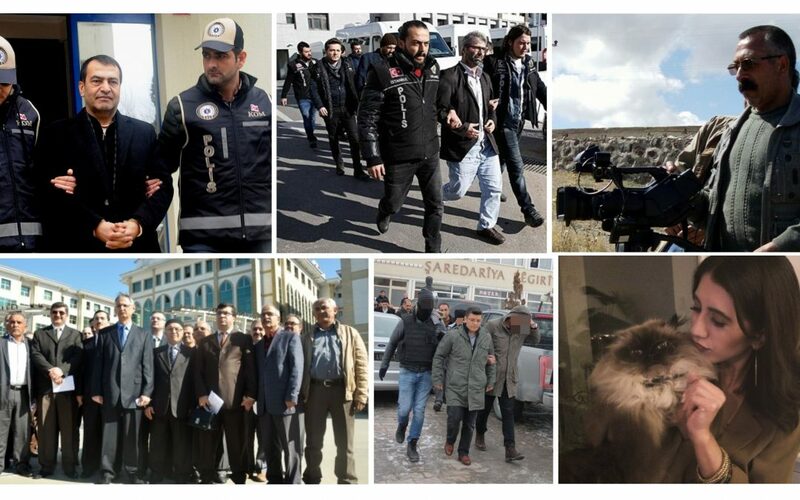 On Jan. 20, nineteen people including academics from Gaziosmanpaşa University were detained in the central province of Tokat due to alleged links to the Gülen movement. On Jan. 20, a Turkish court ruled for the arrest of a pro-Kurdish Dicle news agency (DİHA) reporter on charges of disseminating terrorist propaganda for the Kurdistan Workers’ Party (PKK), according to Evrensel daily.